Once upon a time, the man quite literally won everything. The first and most important element to the man's winning streak was his commitment to listening to radio, that's right the radio! And not just listening to the radio, but listening to AM radio and calling in during the SportsLine Live Radio Talk Show. 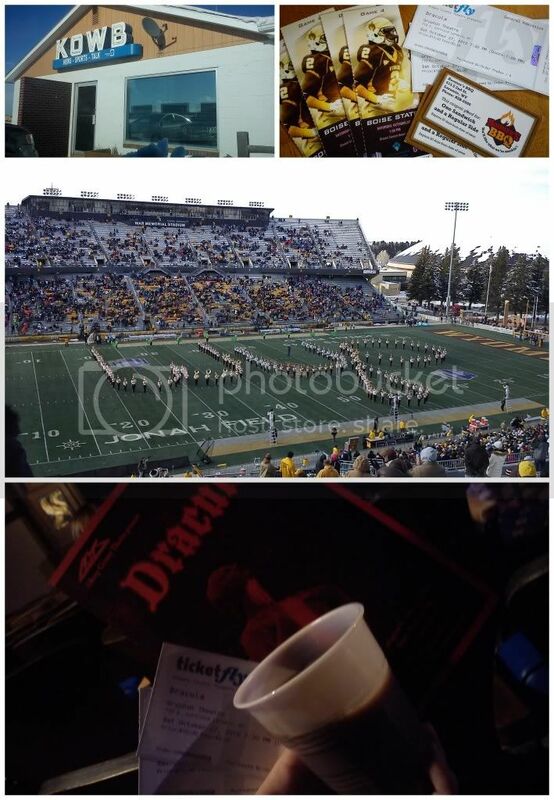 A few nights and days of listening to AM radio and participating resulted in the Harringtons having 4 tickets to the Boise v. Wyoming Football Game, two free coupons for Boomer's BBQ and two tickets for Dracula at the Gryphon Theater! So how did the the variety of activities play out in real life? Next in line for 'free things' redemption were the tickets for Dracula which was to be performed at Laramie's Gryphon Theater, the same theater where Mumford and Son's went 'unplugged' this past August. True joy was had when the Harringtons realized they were encouraged and allowed to purchase an alcoholic beverage to enjoy during the show, so it was, the couple sipped a Micro-brew and glass (plastic cup to be honest) of Chocolate Wine while taking in the talent and entertainment that was a Steam-Punk Dracula performance courtesy of Albany County Theater. Finally, the final award of coupons for Boomer's BBQ was just recently used on Thursday evening and had the Harringtons drinking a local micro-brew (from a can!) out of Pinedale, named after the Wind River Range, chowing down on artichoke dip and out-of-this-world BBQ Pulled Pork and most importantly, topping the whole thing off with a serving of warm Bread Pudding complete with a whiskey sauce made from yet another local craft: Koltiska. If you haven't been to Boomer's, you are sorely missing out and need to go there whether you have coupons or not! And that, dear readers, is the story of the time the Man won everything and the results which were enjoyable, delicious and oh-so-memorable. Wow. That's so nice for you. Such perfect moments in our lives is so rare nowadays. Enjoy them when life lets you experience it.